In my above video I share a recent visit that I made to the newly finished woodworking workshop of Frank Klausz. 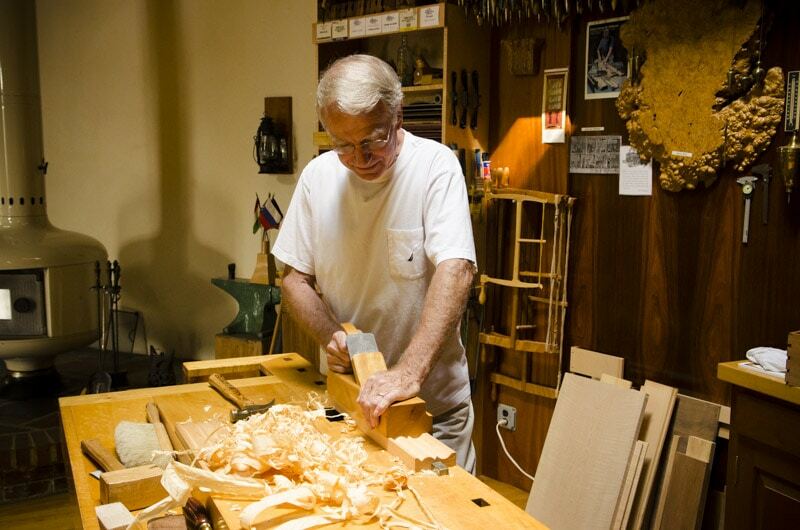 Frank is a world-renowned cabinetmaker and teacher who received his training in his father’s pre-electrical workshop in the mountains of Hungary. When I first arrived at Frank Klausz’s home I was warmly greeted by Frank, his wife Edith, and their Hungarian Vizsla dog. After a quick tour of the exquisite furniture and trim that adorned their quaint country home, we had a very nice conversation about Frank’s upbringing in the remote mountains of Hungary. He was tutored by his father and grandfather in the traditional craft of using hand tools to build furniture, because electricity had not made its way to that part of the Soviet-controlled region of Hungary. As he spoke, I could picture a small candlelit workshop perched on the slopes of a picturesque eastern European mountainside. The Klausz men only used a handful of tools in their shop. 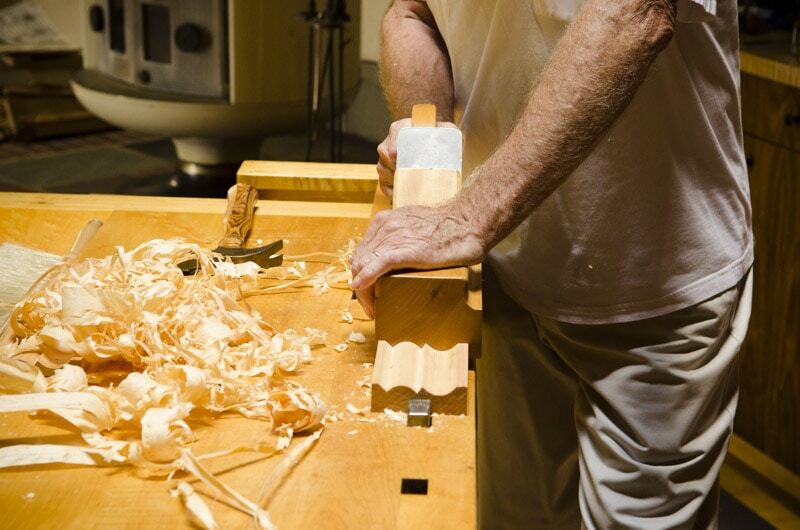 “We only used a few hand planes, five or six chisels, and some handsaws” he emphasized. Frank and his wife Edith then related their story of their courtship before they came to the United States. Edith’s eyes glowed as Frank related his side of the story. He told her that he would marry her after he returned from his military service. He paused. Then a smile came to his face as he recalled her response nearly 50 years earlier “what makes you think that I want to marry you?” I looked over at Edith and a smile stretched across her face. Well, apparently she waited for him and married him, and after emigrating to the United States they had two children, a son a daughter. 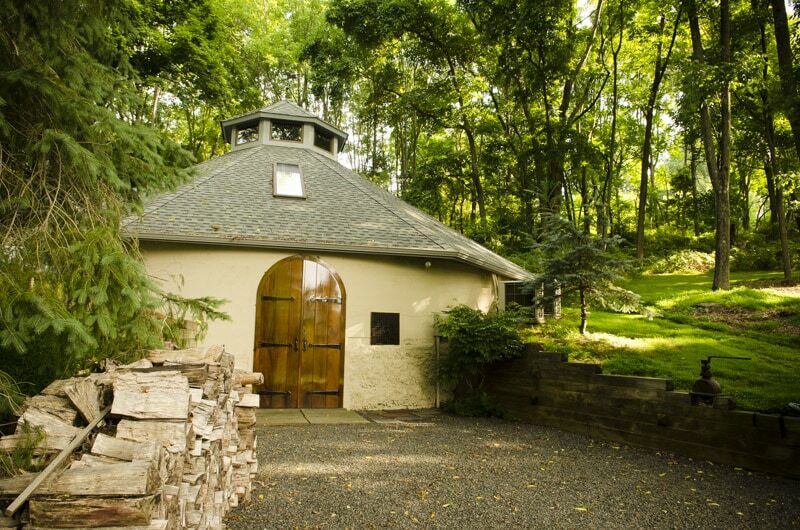 They eventually left the bustle of New York for the quiet calm of the New Jersey countryside. 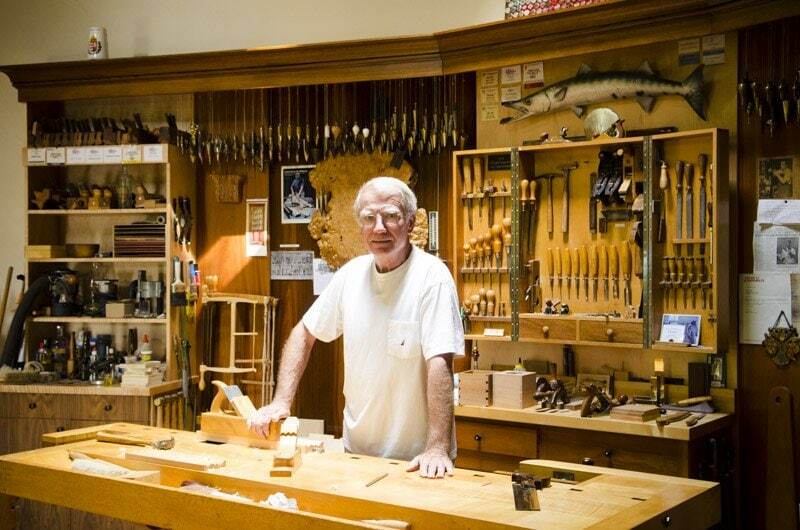 He opened “Frank’s Cabinet Shop” where he worked for years, until retiring 3 years ago. 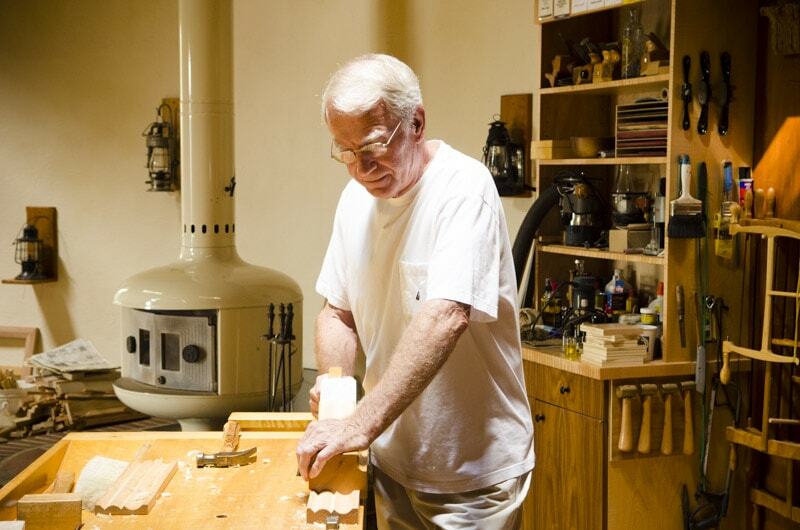 Because Frank is one of the few unbroken links to traditional hand tool woodworking (other than books) he has become somewhat of a celebrity among woodworkers. He has traveled extensively to teach classes & seminars, and has been featured in many woodworking magazines and popular video recordings, like these classic videos. 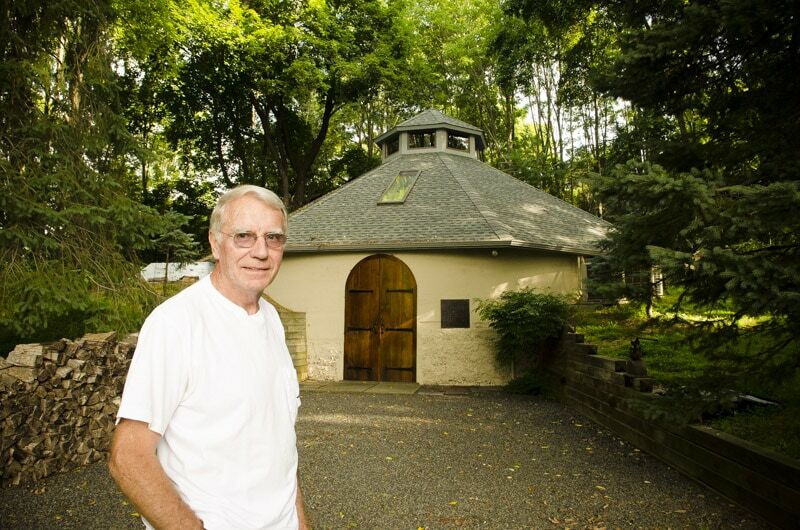 Frank cleverly turned this old water tank into his dream workshop. In our off-camera conversation he related how the water tower used to service fountains for the mansions of business tycoons of the late 19th & 20th centuries. Frank wanted to have a workshop that also doubles as a gathering place. A place to sit and chat with friends on a cold winter night while the wood stove burns away. I was immediately impressed by how clean and organized his workshop was. 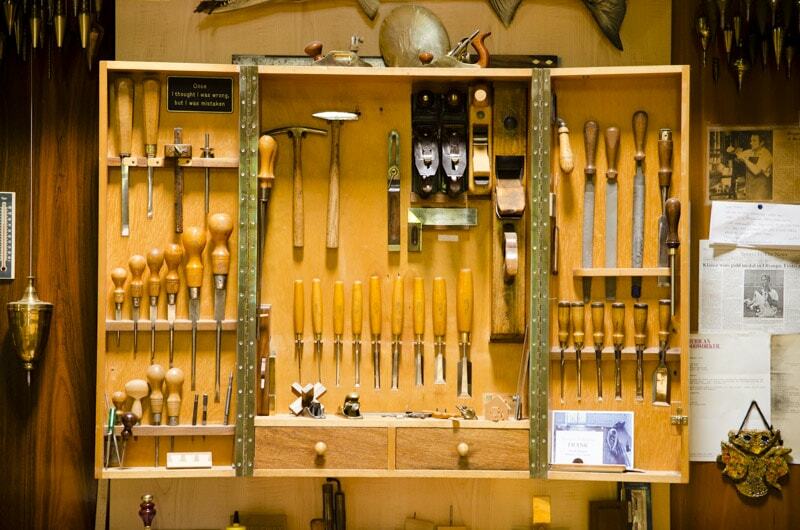 He seems to take great pride in his space and in his tools, especially his plum-bob collection. 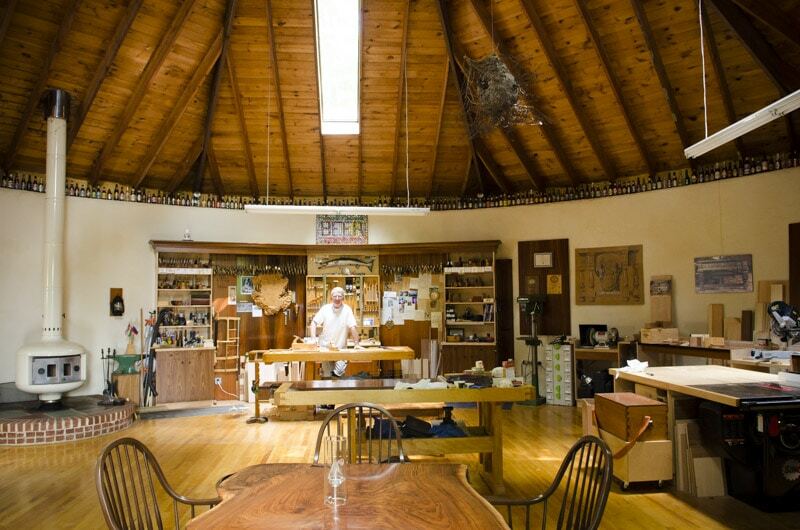 Frank was especially fond of the amazing natural light that his skylight windows spread around his workshop. I have to admit that I felt a bit jealous, coming from a basement workshop. I was immediately impressed by Frank’s down-to-earth, practical, and modest personality. When I asked him about his favorite hand tools I was a bit surprised by his response. I was expecting him to pull out some rare antique handplanes or a special handsaw passed down from his grandfather. But Frank pulled out new tools made by quality manufactures. His absolute favorite tool is a Lie-Nielsen No. 4 Smoothing plane. He was so impressed by the improvement upon the old Stanley Bedrock No. 4 design. Although he loves the old tools, Frank isn’t trying to appear as a “purist” or a “tool snob” who only uses rare antique tools. He loves how some new manufactures are improving upon the best designed tools of the past. 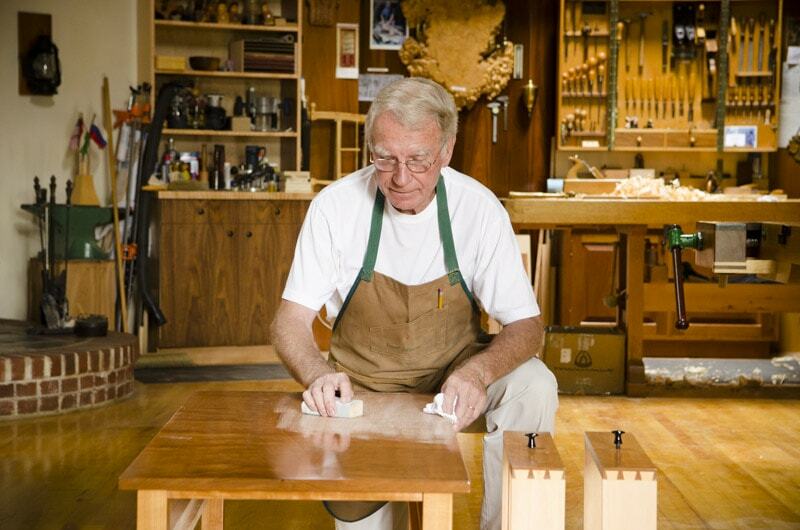 Frank is a real cabinetmaker who values innovation and features that make the job easier. He’s something of a tool innovator himself. He is very well known for his creatively-designed “Waterstone Pond” which is used for sharpening chisels and handplane irons. I have to admit that the first Woodworking DVD that I ever watched (I checked it out from the library) was Frank’s “Hand Tools” video. I first saw the this waterstone pond in that video, and have wanted to make one ever since. I found a PDF of the 1996 article, available for download here. He told me a funny story about a time that he built his Waterstone Pond on Roy Underhill’s The Woodwright Shop television program. Because the program has to be filmed all with one take, no breaks can be made for mistakes; the camera keeps rolling. Roy noticed that the joint that Frank was showing was messy, so Roy grabbed Frank’s arm and quickly yanked it around so that the close-up camera would see the nicer joint on the other side. Gotta keep up appearances! One thing I was looking forward to seeing in Frank’s new workshop was his huge wall of molding planes (as seen in his DVDs). 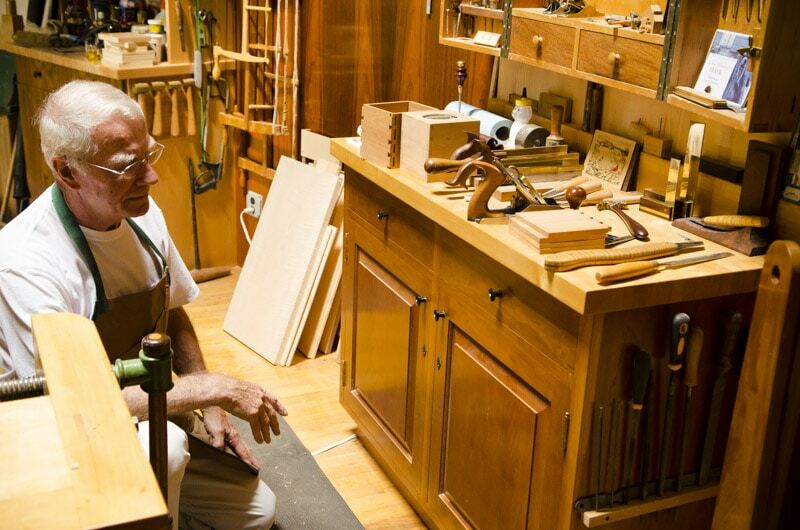 I’ll admit that I was sad to learn that he had sold over 100 molding planes after his retirement from full-time cabinet making three years ago. 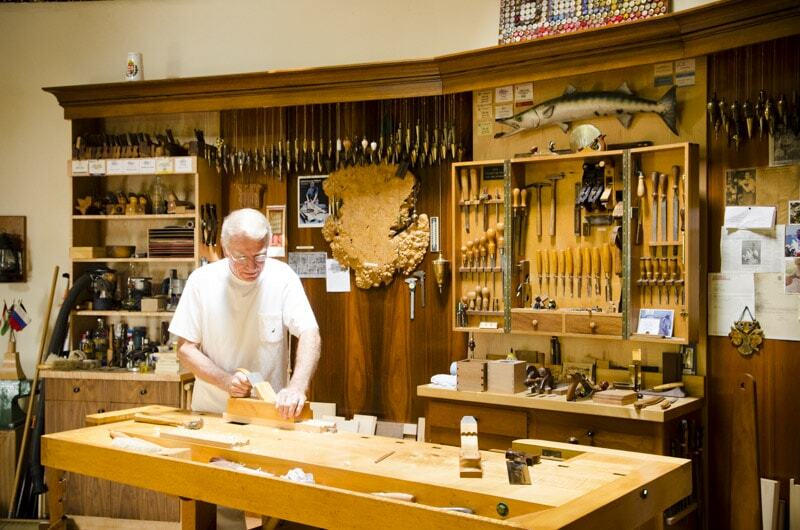 In his endearing Hungarian accent he asked, “why would I ever need that many molding planes?” A very practical man indeed. 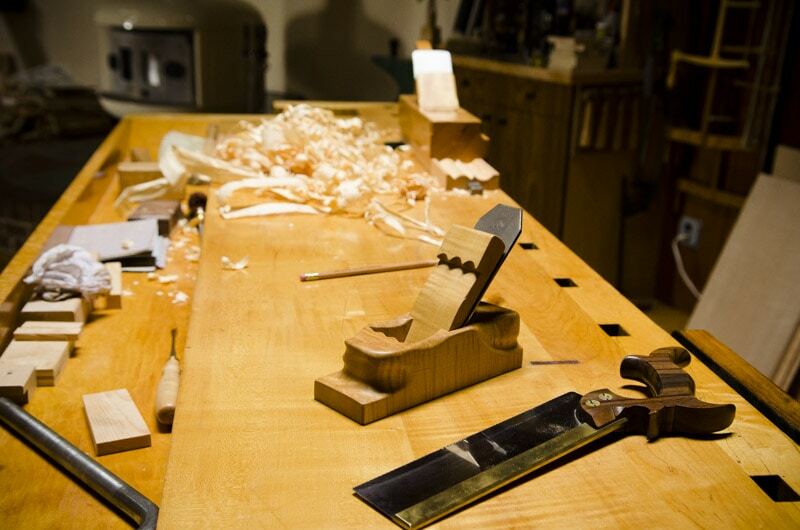 Still, I wouldn’t mind owning that many quality molding planes. 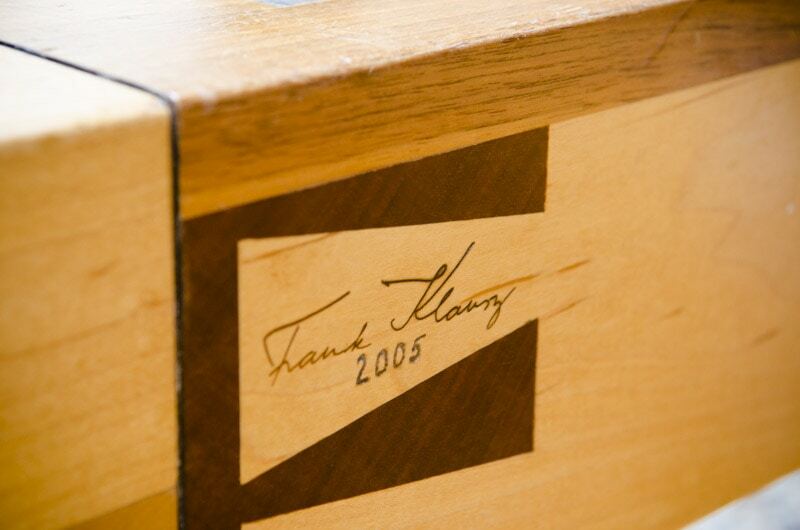 Frank took me over to the cherry coffee table that he was finishing up for his daughter, who lives nearby. I can tell that he finds his greatest workshop-joy building heirloom quality furniture for his posterity, and he said that they love receiving the furniture. I can tell that it is furniture that will be around for his great, great, great grandchildren to inherit. I felt honored to listen as he instructed me on how he carefully builds up his Waterlox oil finish. 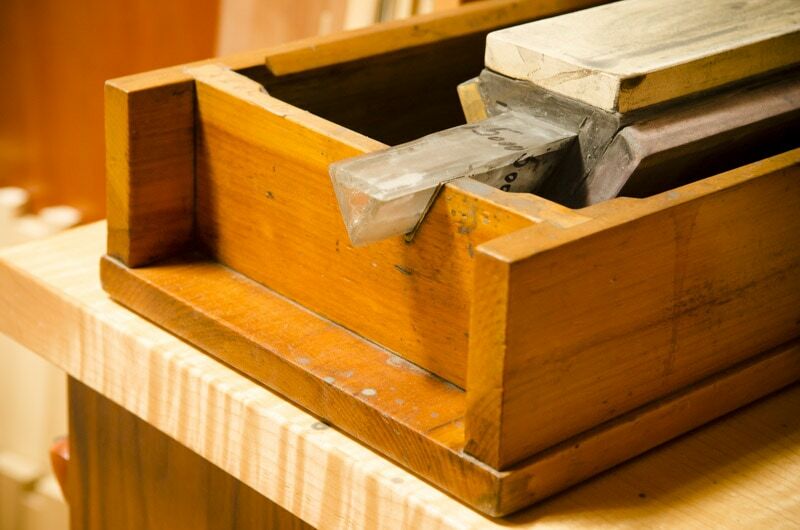 Frank wouldn’t let me go before having me film his dovetail demonstration. After all, “that’s what I’m known for” he said. That video will be posted next week, so subscribe or keep checking back! 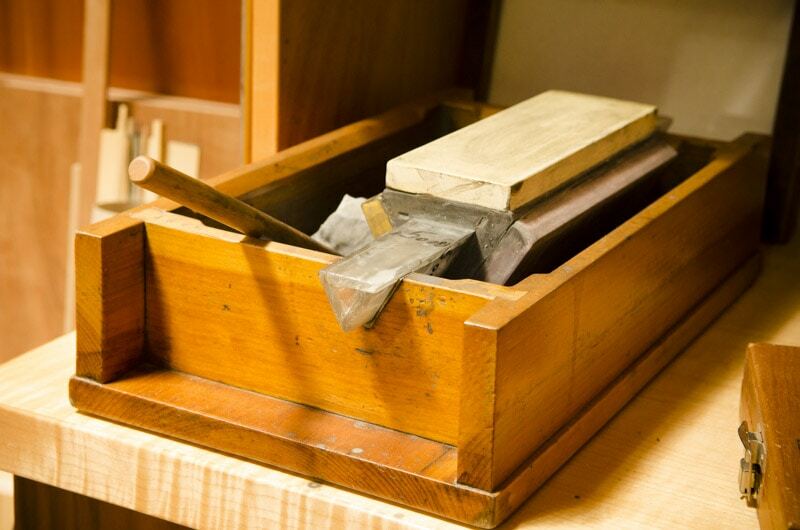 Frank also wanted to show me a huge molding plane that he built for a magazine article. The editor wanted Frank to create a large molding for the story, so naturally Frank was going to use hollows & rounds to make the molding. “No” replied the editor. “With one plane”. So Frank had to build the beastly handplane. Frank insisted that we film this giant in action. I was thrilled to do so! I’ll share that video very soon as well. 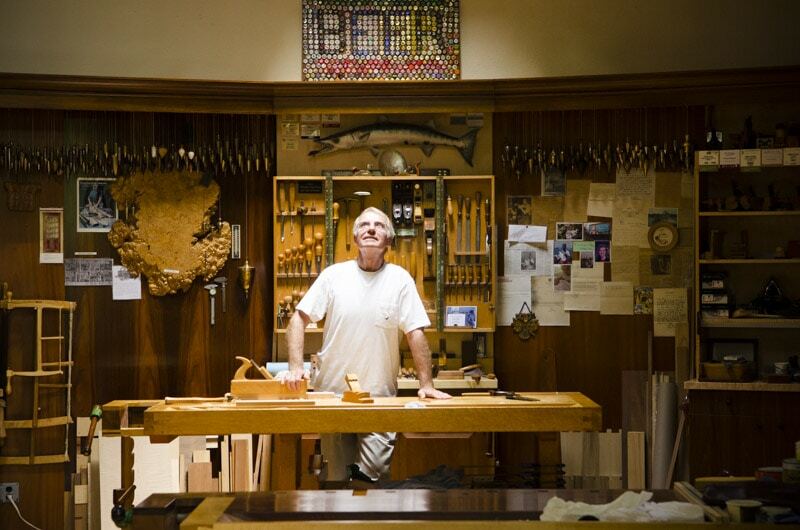 I felt so fortunate to be welcomed into the dream workshop of a man who has been instrumental in preserving one of my favorite things in the whole world: traditional hand tool woodworking. Thanks Frank! That was AWESOME!!! 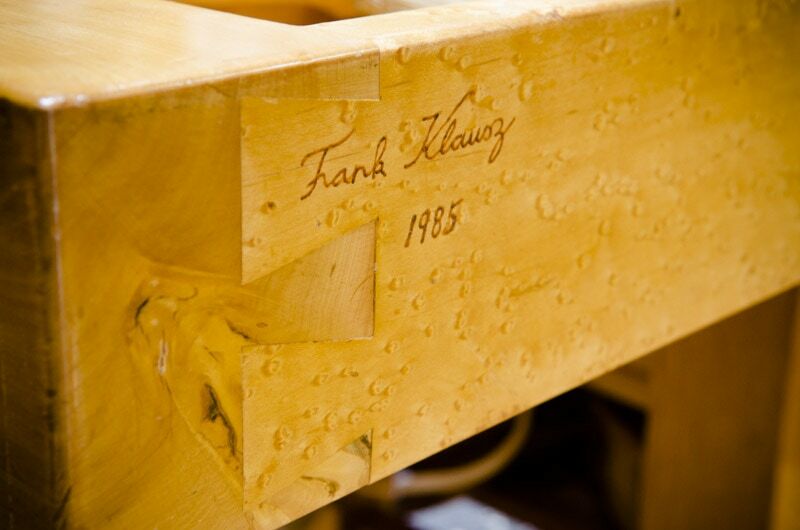 I have studied and drooled over photos of Klausz’s bench in “The Workbench Book” for years. Thanks for the interviews. I’ll be looking forward to the next. I’m glad you liked it Jason! You’ll enjoy the next couple videos that I took at Frank’s shop. Thou shalt not covet! Darn it. Just failed that commandment watching that video. What a beautiful shop. Great video Josh. Yea Jonathan, I think I broke the commandment about not lusting…but perhaps tool lust is alright? Awesome, I’m glad you enjoyed it Jeff! Bob, thanks for watching Frank’s workshop! What a treat to see Frank and Lie Nielsen at Highland Hardware this weekend. Just amazing. I should be so talented. Ha, ha. You certainly can be as talented as Frank! Glad you are enjoying my website Bob! I’m glad you found it! Very cool about the class you took from Frank. I hope you keep following to see other cool workshop tours! I watched some videos of this a while back, and recommend them to all my friends. Awesome shop and work. Thank you for the compliment Allen! Simply awesome! Thank you for taking us along! I’m glad you enjoyed the tour of Frank Klausz’s shop!